On a recent trip to Spain, I was in awe of the displays of Christmas lights in cities big and small. From bulbous blue lights hanging over the winding streets of Barcelona's Barri Gotic, to gigantic neon-green Christmas trees in Madrid, to a seemingly endless draping of bells and garland-shaped light strings in Seville, there was no shortage of fluorescent holiday expressions. Our Christmas lights here in the U.S. are dim in comparison. Many of these bright lights lit the way to charming Christmas markets found along pedestrian streets and major urban squares across the country. Spanish Christmas carols were heard from a chocolate vendor in Seville. Fresh pine wreaths adorned outdoor booths in the nation's capital. 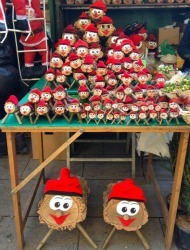 Vendors in Barcelona sold logs with faces and hundreds of defecating figurines. Wait, what was that?! Indeed, each year, shoppers descending upon Barcelona's Fira de Santa Llucia on Avinguda de la Catedral – now in its 225th year – may stumble upon the " El Caganaer " (roughly translating to "crapper") booth. Here, you may purchase dozens of types of caganer figures, each with their pants down to their knees (or skirts up to their waists, depending), soiling the ground beneath them. Furthermore, Catalans place caganers in their holy Christmas crib nativity scenes. Don't write this practice off as blasphemous just yet. The obliged caganers are believed to help fertilize the crib's soil, making it rich and productive for a prosperous New Year. Additionally, the caganer serves as a good luck charm of sorts – tradition holds that he brings good health, calm, and happiness. Traditionally, caganers take on the form of a man donning a classic red Catalan beret and old-fashioned garb. As word spread, and technology advanced, the palm-sized figurines have morphed into a large production each year, with numerous types of characters available. From political figures, to major soccer stars, to celebrities, to popular cartoons, the choices of caganers are seemingly endless. Having that brief explanation of the caganers in mind, you would be right to assume that the aforementioned grinning logs tie in to a similarly bizarre holiday tradition. Known as Tio de Nadal (Christmas logs), or more commonly, caga tio (crapping log), these rustic holiday companions are essentially a hollow piece of firewood with four miniature stick legs, a painted face, and a tiny wooden nose. From the Feast of the Immaculate Conception up until Christmas Eve, the tio is given a tiny "meal" of orange peel and chocolate each night, then is typically covered with a red blanket so that he doesn't get cold. Come Christmas day, the poor little tio's short life comes to an end. Catalan children beat the blanket-covered tios with sticks while the family sings traditional Tio de Nadal songs. Similar to piñatas, the tio is pulverized until gifts like candy, or small toys are released. Unlike piñatas, tios are thought to generate these goodies through excretion. The more the tio was fed throughout the month, the more gifts the kids will find underneath the tio's blanket. This holiday season, if you're looking to shake up old traditions and have a more worldly celebration, consider dropping a caganer in the manger, and have the kids burn up some energy by hitting a caga tio. You may end up having that much more of a happy, healthy, and prosperous New Year.